Be the first to share your favorite memory, photo or story of Ramona "Rome". This memorial page is dedicated for family, friends and future generations to celebrate the life of their loved one. 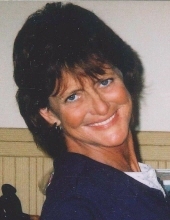 Ramona D. “Rome” Booher, 62, of Bellefontaine, OH passed away Thursday morning, January 17, 2019 at her home. Ramona was born on May 28, 1956 in Bellefontaine to the late Marion Sherer and Patricia Crouse Sherer. Rome married David Booher on February 19, 1983 in Zanesfield, OH and he survives along with two sons, Cody (Stephanie) Booher and Kyle (Ally) Booher, two grandchildren, Addison Booher and Charlie Booher, and two sisters, Deb Sherer and Nicki (Gary) Trout. Rome was a 1974 graduate of Ben Logan High School. She worked at Westinghouse in Bellefontaine, and then Honda of America. Rome was a member of Charles Collins American Legion Post #381 Auxiliary. She enjoyed bowling and loved being at the Lake House spending time with family and friends. Anyone who knew Rome, knew her as fun-loving and a jokester. She was always ready for a good party and made most any situation a little better with her wild and crazy personality. Gary Trout will lead a celebration of Rome’s life beginning at 7:30 pm, Tuesday, January 22, 2019 at Shoffstall Funeral Home, 205 S. Main St., Lakeview, with visitation from 5-7:30. In lieu of flowers, memorial contributions may be given in Rome’s name to the Cystic Fibrosis Foundation or cff.org/centralohio/. To send flowers or a remembrance gift to the family of Ramona "Rome" D. Booher, please visit our Tribute Store. "Email Address" would like to share the life celebration of Ramona "Rome" D. Booher. Click on the "link" to go to share a favorite memory or leave a condolence message for the family.